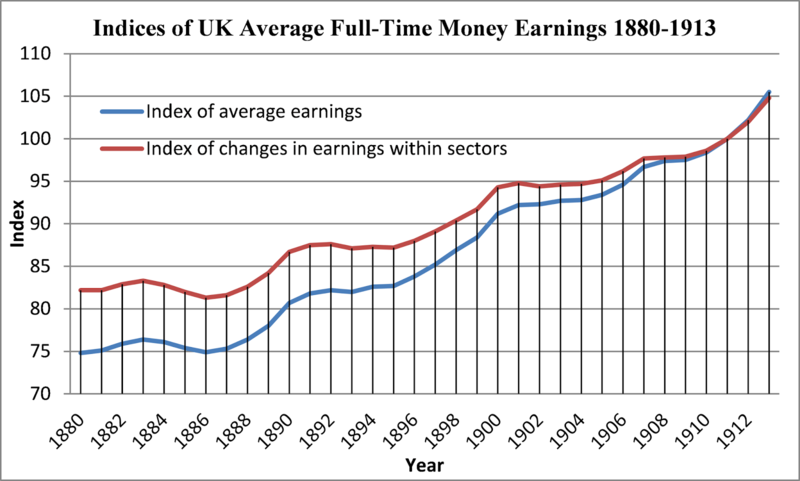 Feinstein (1990) provided a new index of UK average full-time weekly money earnings, and his data can be seen in graph below (Feinstein 1990: 612, Table 6). The graph shows both an index of average weekly money earnings and of changes in money earnings within sectors. It can be compared with that of Wood (1909), though the differences are not that great. Although Feinstein’s data are average weekly wages, the average number of hours worked a week stood at about 56 in 1873 and was relatively steady at this figure until 1913 (Boyer 2004: 285), so that this fact does not necessarily mean that the data is an unreliable indicator of average hourly wage rates. What stands out is that, as the late 19th century drew to its end, British money wages seem to have already developed a strong degree of downwards rigidity. While nominal wages did fall in the period of recession and rising unemployment from the 1875 to 1879 era (which can be seen here in Wood’s data), by the recession of 1891–1893, money wages were essentially stable. In subsequent recessions in the 1897 to 1913 period (namely, in 1900–1901, 1903, and 1908), money wages remained stable and were clearly affected by wage stickiness. It is consequently difficult to argue that the recovery in 1894 and those in subsequent years after recessions were driven by downwards wage flexibility. Even in the recession of 1884–1885, nominal wages only fell mildly. All in all, this would seem to confirm that downwards nominal wage rigidity, in the era of price deflation of 1873–1896, was a significant cause of the “profit deflation” that contemporaries started to complain of by the 1880s. Boyer, George R. 2004. “Living Standards, 1860–1939,” in Roderick Floud and Paul Johnson (eds. ), The Cambridge Economic History of Modern Britain. Volume II. Economic Maturity, 1860–1939. Cambridge University Press, Cambridge. 280–313. Feinstein, Charles H. 1990. 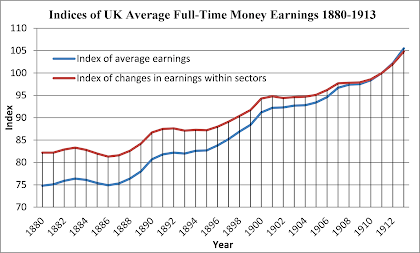 “New Estimates of Average Earnings in the United Kingdom, 1880–1913,” The Economic History Review n.s. 43.4: 595–632.